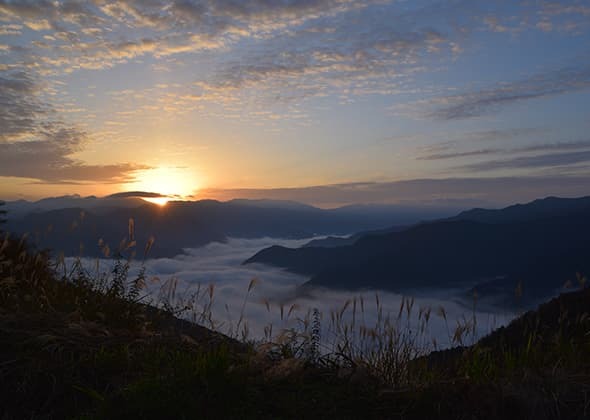 The fog that arises alongside the Yoshino River becomes the sea of clouds of Miyoshi City. You can look across, enjoy, and photograph the various views of Oboke, Yoshino River, as well as the Kochi prefecture direction. The time frame in which the sea of clouds can be seen: Sunrise to 7:30AM. The time of year in which the sea of clouds highly occur: March to April and October to December. 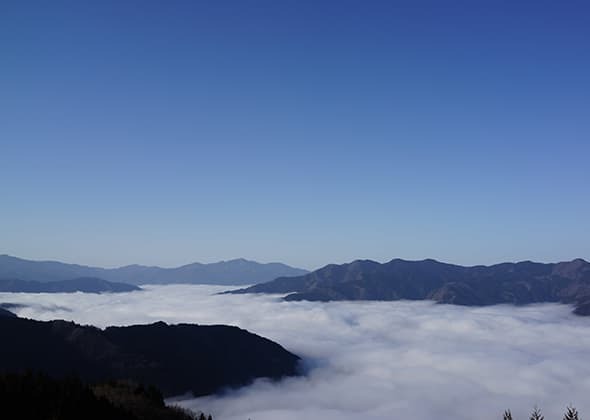 The climatic conditions in which the sea of clouds highly occur: When there is a large temperature difference compared to the previous day as well as a clear sunny sky in the morning of that actual day. This Outlook was completed in the end of March in 2015. 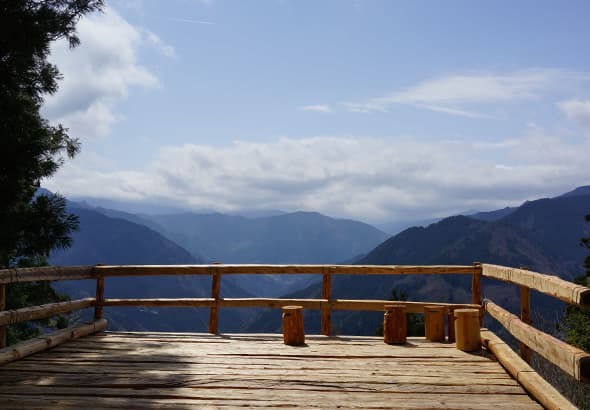 The wood of the cedar trees that previously intercepted the view were utilized to build the 6 meter-wide, 4 meter-long wood deck (altitude 599 meters) of the outlook. In addition, there is a wooden hand rail located 100 meters right before of the outlook and you can look across the view in the direction of Oboke and Nishiiyama. *The required time (approximate) is a reference value and is calculated with some extra time included. From JR Awa-Ikeda station take the Shikoku Transport Bus (Okhobai Via Kazura Bridge Line) and get on at the bus stop ""JR Awa Ikeda Ekimae,"" → Get off at the bus stop ""Oi-no-uchi"" and then walk about 1 hour on foot. Or alternatively, take the above bus at JR Oboke Station. ※ It is approximately 15 minutes by taxi from JR Otoboke Station. 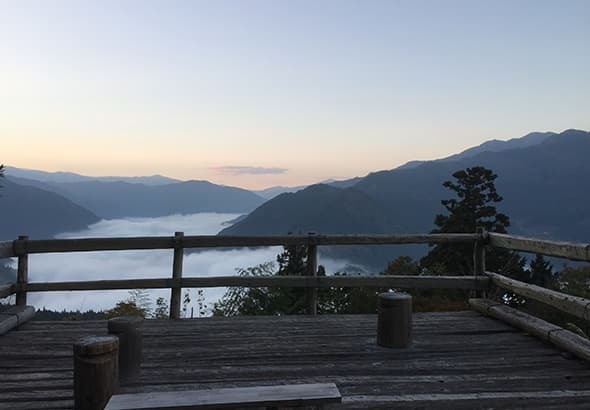 The great outlook overlooking from the Kenzan mountain range to the Ishizuru mountain range is the highlight of Kunimi Mountain! 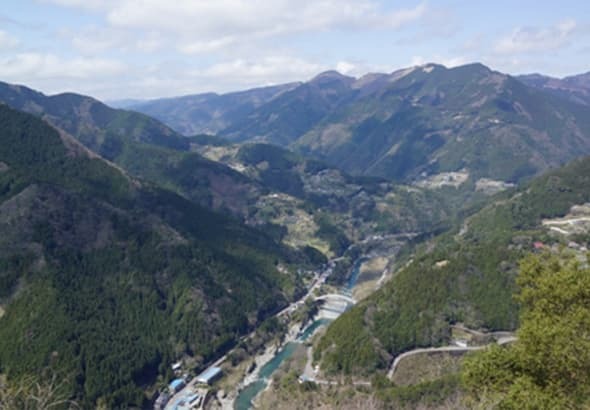 Kunimiyama (altitude 1,409 meters) mountain is located in between Iya vlley and Obokekyo valley. The view from the outlook is around 360 degrees. The optimal mountain climbing season is from early April to late November. The view in November is especially magnificent. 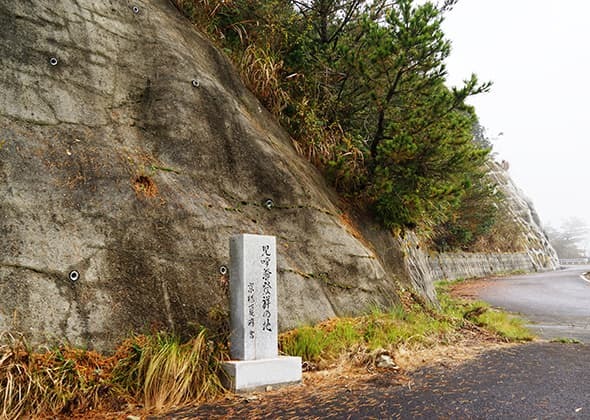 ※It is approximately 1.9 Km (about 50 minutes on foot) from the mountain parking lot to the summit. ※ There is no toilet at the mountain climbing parking lot. ※ The capacity for the mountain climbing parking lot is around 10 passenger cars. From Ikawa-Ikeda IC Route 32 (Kochi direction) → (at Oboke) turn left and go to the prefectural highway 45 (Izuya Kazura-bashi direction) → Turn right at the entrance of Iya Tunnel → Turn left at the three-way junction (towards Tohoyama: After going straight will turn into Ahashi direction) → After driving upwards and starting to descend, there will be a ""dead-end"" sign so turn left (if you go staright you will go towards Kazura-bashi direction) → Turn left at the next three-way junction (turning right will actually lead to a dead end) → After approximately 10 minutes, you will arrive at Kunimiyama mountain climbing entrance. Take the Kazura Bridge line bus from JR Oboke Railway Station, get off at bus stop ""To-ge,""then it is about 60 minutes on foot from the bus stop to the hiking trail entrance. ※ It is approximately 30 minutes by taxi from JR Otobake Station. 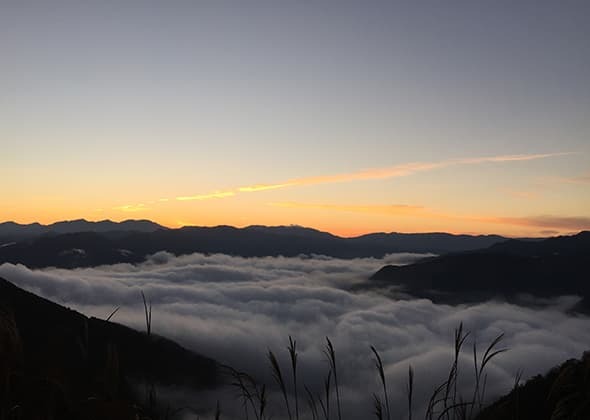 Even at several points where the sea of​clouds can be seen, you can also see the superb view of the collaboration of the sunrise and the sea of clouds ! It is a good mountain pass with an altitude of 970 meters and a wonderful view. If the visibility is good, the Yoshino River and Oboke Bridge are visable far below. ※ The capacity for the parking lot is around 10 passenger cars. Enter "Tobi-no-su-kyo" from the national highway No. 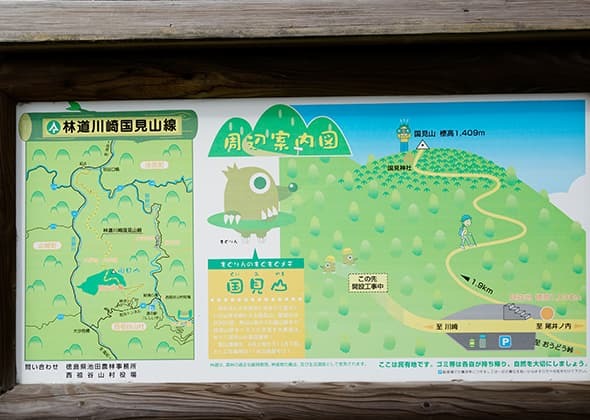 32 → Proceed for roughly 5 km → Turn left ( in front of Okukoboke Hot Spring, start going uphill) → Proceed in one straight road for approximately 5 km → You will arrive near the summit→ Turn right and proceed for a couple hundred meters and you will arrive at　a large square (=photo spot!). 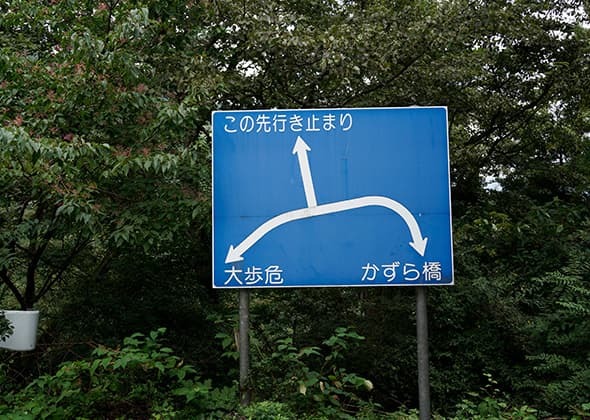 Enter ""Fujikawa Valley"" from the center of the hotel 32nd National Highway route→ Proceed for approximately 5km, then turn right at an acute corner at Taira bus stop → (there will be a sign) Turn left (If you turn right there will be a dead end at the Hirata family's house) → (there will be a sign) Turn right → After merging with a wide forest road (Ogawahira-line), turn right → [proceed for 2 to 3 km] then after a couple hundred meters, you will arrive at a large square (=photo spot!). * The required time (approximate) is a reference value, and some margins are included.